I'm quite behind on episodes of one of my favorite public radio programs "Being" (formerly called Speaking of Faith). 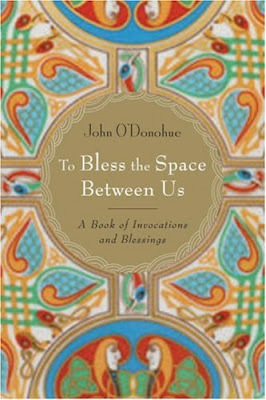 I recently heard the November 25th episode with John O'Donohue. You must listen! Here's the link to the episode: The Inner Landscape of Beauty. It's genuinely thought-provoking and lovely. The man being interviewed, John O'Donohue, was SUCH an incredible man. He died in his sleep in his early 50s a few years ago. Recently, a dear friend sent me a copy of his most recent book. It was published after his death. It's a book of blessings; wonderful! I encourage you to consider ordering it - it's WAY on sale on Amazon. If you give this episode a listen, please leave a comment; I'd love to hear your thoughts on it. Oh my goodness, Emily, I *loved* that episode of Being! I listened to it while I was stuck in that big snowstorm in Minnesota in early December, and it helped calm and center me and helped me see how the storm was a beautiful creation, not a nuisance. Next time I am at 57th St Books I will definitely look for his works.